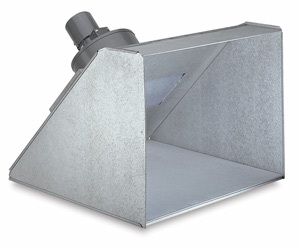 Rugged and compact, this portable spray booth features galvanized metal construction for easy cleaning and durability. Working dimensions are 24" wide × 18" high, perfect for small ceramics and models. It provides approximately 80 to 100 LFM air movement. Uses a carbon and fiberglass filter system, intended to remove larger particles from the air, but will not remove ALL hazardous materials. When spraying harmful chemicals, exhaust should be vented to the outside. Includes a 1 phase, 60 cycle motor. The booth is equipped with 3-wire cord, and requires a grounded 115V power source. It weighs approximately 42 lb (19 kg).